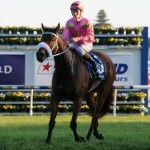 Kenjorwood impressed in Adelaide on Saturady (29/04) in the $110,000 Listed City of Adelaide Handicap. Kenjorwood carried 61kg over the 1,400m event and came from last to finish 4th beaten just a length. This appears to be a perfect lead up to the $250,000 Group 3 R A Lees Handicap over 1,600m at Morphettville on the 20th May. Kenjorwood has been hitting the line hard over 1,400m and the step up in distance to 1,600m and also returning to set weight conditions will mean that Kenjorwood will be a very good chance in the Group 3 feature. Grenville would like to wish connections the best of luck with Kenjorwood in his campaign in Adelaide and also the recently purchased full sister to Kenjorwood who was purchased at the 2017 Tasmanian Magic Millions sale for $160,000 and has recently commenced being broken in.